Imagine that you come home to an empty house, and while you're pottering around downstairs you hear a noise upstairs. Upon investigating, however, you fail to discover anyone upstairs. So you head back downstairs to make a drink, and then you hear another creak up there, like someone's walking around. This time you look around more thoroughly, checking wardrobes and closets. Still no one to be found. After a while of this repeatedly happening, you begin to wonder what the heck is going on. Well, this scenario could be an analogy for a missing Planet X body in the outer solar system. Astronomers have been looking 'out there' for another planet for over 100 years, and a great deal of anomalous data has suggested its existence during that time (1). Their search turned up Pluto back in 1930, and in recent decades a large number of smaller Pluto-like objects that together make up the Kuiper Belt located beyond the planet Neptune. Yet, despite searches with powerful optical and infra-red telescopes, no Planet X object has yet emerged from the gloom. So, is the solar system's upstairs clear of occupants? Not according to the data from the newest and most distant objects discovered out there, the so-called extreme trans-Neptunian objects or ETNOs (2). These asteroids never get closer to the Sun than distant Neptune, and extend out beyond 150 Astronomical Units, which is five times that distance. Analyses of their orbital paths indicate that they are collectively being affected by much larger, more distant objects - possibly two planets sized "between Mars and Saturn" (3). "The Kozai Mechanism causes a periodic exchange between the inclination and eccentricity of an orbit. "It has been theorized that the Kozai Mechanism is responsible for the high eccentricities observed in the orbits of exosolar planets. If the parent star has a massive yet unseen substellar companion, orbiting at a great distance, and in an orbit highly inclined to the plane of the planets' orbits, the Kozai Mechanism should induce high eccentricities into the orbits of the planets. "It is also theorized that the Kozai Mechanism may be responsible for the high eccentricities observed in the orbits of many Kuiper Belt Objects such as 2003 UB313. The pull of the Milky Way Galaxy causes an object with a high eccentricity to periodically trade this eccentricity for a gain in inclination. In our hunt for Planet X, the Kozai mechanism is therefore both a helpful theoretical tool for understanding how the orbits of these ETNOs might be getting affected by more distant, massive bodies; but also a consideration that potentially limits the grounds for a sub-stellar companion. Why? Because, in a similar way to the Jovian example above, a highly-inclined massive sub-stellar companion might distort other planetary orbits in the solar system so dramatically as to bring about a highly chaotic, even unstable arrangement - one that is, arguably, not seen in the present solar system. That said, there was plenty of catastrophic and migratory activity evident in the early solar system, potentially indicating the Kozai effect at work at that time. Which brings me back to my initial analogy. These footfalls heard upstairs (the perturbed orbits of the extreme trans-Neptunian objects) seem to indicate the presence of a ghost! Every time we seek out the source of the sounds, the culprit has disappeared. We know it's not down to our imaginations. We think that our powers of observation thus far should have been up to the task (5). So, either it's hiding in the attic (i.e. way out in the Oort Cloud) or the sounds are being produced by a ghost. A ghost planet, perhaps? It is almost as if the solar system is haunted. Now, there are plenty of Planet X researchers on the fringe who have speculated about all kinds of exotic solutions for Planet X to explain its seeming embarrassment about coming out into the open. I've heard of tiny black holes, plasma stars, and even cloaked planets! I'm not convinced by any of these arguments, but I can see why researchers have brought their (often wild) imaginations of bear upon this problem. Simply put, despite astronomers scouring the rooms upstairs for evidence of occupation and come up with nothing, the anomalous sounds up there simply won't go away! 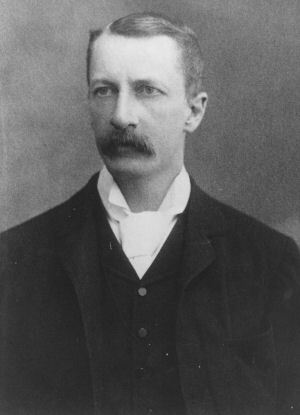 It came as something of a surprise to me that a similar scenario regarding two undiscovered planets beyond Neptune was predicted as long ago as 1880, by a Scottish electrical engineer and astronomer George Forbes (1), fifty years before the discovery of Pluto by the Planet X-seeking astronomer Clyde Tombaugh (2,3). 5,000* n.c./n.c./n.c. 45 deg. n.c./n.c. 185 deg./n.c./n.c. 1,076 0.167/87/122 52 deg. 115 deg./1702 247 deg./n.c./n.c. 1,400 0.35/81/169 37 deg. 160 deg. 51 deg./95/n.c. Adam was thinking more about problems revolving around the Kozai mechanism, but such a scenario might also provide helpful insight into other anomalies, e.g. the perturbation of the trajectories of the Pioneer spacecraft but not the Voyagers (8). The prevailing theory about where Earth's water came from centres around multiple collisions with water-bearing comets through its lifetime. How else to explain the beautiful oceans of water resting upon the surface of a relatively warm world located so close to the Sun? We now know that water is common through the solar system, but the planets closer to the Sun generally lose it over time. Not the Earth, though. The transition zone is now known to include a mineral called ringwoodite which acts like a sponge, soaking up and trapping water. 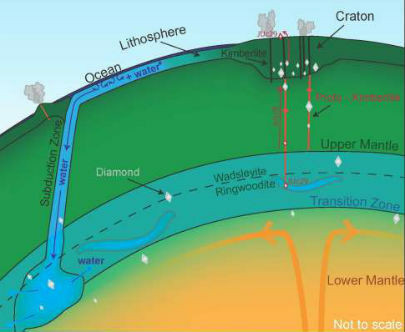 Jacobsen speculates that water trapped in the Earth's mantle in this way may be part of a 'whole-Earth water cycle', allowing movement of water to the Earth's surface driven by geological activity. This cycle may then explain the existence of the Earth's oceans, without the need to rely upon cometary impacts. Sitchinites will find this a welcome development. 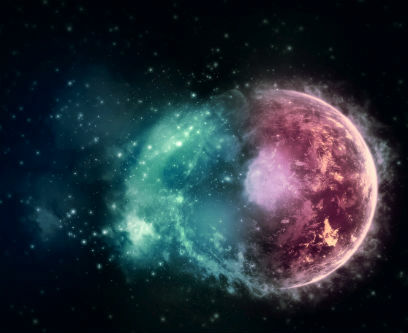 After all, in Sitchin's theory, the Earth was indeed initially a water-covered world which lost much of that water as a result of a collision, or encounter, with a transiting rogue planet. The discovery of huge sources of underground water might provide further clues to that watery past. "The first set of high-resolution results from ESA’s three-satellite Swarm constellation reveals the most recent changes in the magnetic field that protects our planet. 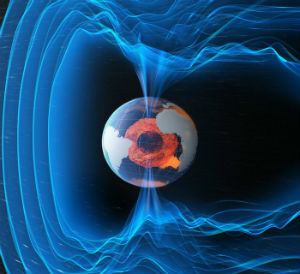 Launched in November 2013, Swarm is providing unprecedented insights into the complex workings of Earth’s magnetic field, which safeguards us from the bombarding cosmic radiation and charged particles. It's pretty clear that the overall magnetic field is subject to a number of environmental and geophysical factors, and disentangling all of these elements presents some major challenges for scientists studying this new stream of data. What might this tell us about what our planet is made of, where and how it formed, and what affected it from elsewhere in the solar system? Astronomers seeking life beyond our solar system are increasingly looking to the dwarf star systems to find life-supporting planets. Our Sun is actually classified as a yellow dwarf star, and the next step down in the pecking order are the red dwarfs. These are highly numerous in the galaxy, with many red dwarfs in our stellar neighbourhood. Recently, there has been some scepticism about whether planets in the habitable zones of red dwarf stars might be capable of supporting life. They would have to lie very close to the parent star, but in doing so would then be subject to their highly energetic emissions in the form of stellar flares and other extreme space weather (1). The protection afforded by the planet's magnetic field may be insufficient to prevent the orbiting world from being periodically irradiated by highly destructive radiation. So, how about smaller dwarf stars? Surely the radiation they emit would be on a far lesser scale? 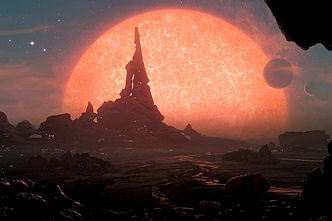 The next category of dwarf stars are the brown dwarfs (which, quixotically, are also red). They are essentially failed stars ranging from hot Jupiters of 16 Jupiter masses right up to their bigger sisters, the red dwarfs, at about 80 Jupiter masses. Some of these brown dwarfs are individual, free-floating 'stars' in their own right, while others are companions to larger parent stars. Habitable planets orbiting around these failed stars would need to be closer still than those around red dwarfs, but the threat from irradiation would be far less as the brown dwarfs are much less active than red dwarfs. "[Andrew] West [assistant professor at Boston University's department of astronomy] says one big unanswered question is how the very smallest stars and brown dwarfs--objects less massive than stars, but more massive than planets--form. "We really don't understand the details of how these processes work," he says. "They have not been studied in great detail in the past, and there is a lot of uncertainty about the mechanisms that lead to forming stars of this size or brown dwarfs, these 'failed' stars, if you will." Typically, stars form within clouds of dust and gas when there is sufficient mass to collapse by gravitational attraction. As the cloud collapses, the material at the center begins to heat up, a hot core in the heart of the collapsing cloud that ultimately will become a star. The difficulty in their detection and study increases almost exponentially as you drop still further down the dwarf star league. Between the gas giant planets and the smallest of these brown dwarfs are the sub-brown dwarfs. Until recently, their very existence was theoretical, but examples have been discovered, mostly orbiting in tight, sometimes eccentric orbits around distant stars. It is only the wobble of the parent stars themselves, as their movement through space fluctuates due to the gravitational interaction with their sub-brown dwarf companion, that leads to the companion's discovery. And only the mightiest telescopes built, and in the planning stages of being built (like the Extremely Large Telescope in Chile (3)), have any hope of studying them closely. Until then, these 'dark Stars' will hold on to their secrets. If this month's blog seems a little sparse, then I would like to extend my apologies and add that, in mitigation, I've been hyper-involved with art this last month or so. 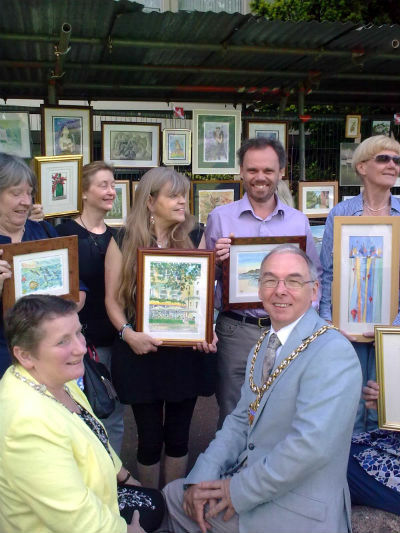 This year, I became Chair of Cheltenham's 'Art in the Park', taking over from my good friend Jane Ware (pictured to the left of me in the adjacent image) who has been carrying out the role for the last four years. I've been putting up my paintings at the exhibition almost every year since the mid-nineties (the only year I missed was when my youngest son Robbie was due to be born) and have been serving on the committee that runs it for most of that time. It's an honour to be the Chair, particularly since I'm really a Gloucester lad - the exhibition is my only connection to Cheltenham. But 'Art in the Park' has been a part of my life for such a long time, I guess I've been adopted by the place to some extent. Inevitably, the time I've devoted to make sure that the exhibition runs smoothly, as well as recent commissions and preparations to present my own work this year, have meant that I've had less time to devote to my long-standing Planet X studies. I've been asked a couple of times recently about when I'm going to write a new book, and I have to admit that that would be a very difficult prospect at the moment, given this and my regular work commitments at the hospital. It's a shame, because I have ideas for the next novel, as well as a supportive publisher, but lack the time to undertake such a project just at the moment. However, my commitment to continuing with my interest in Planet X, and to keep writing these blogs, is undiminished and I will continue to do so just so long as there are people interested in reading what I have to say. So, many thanks to you for your continuing support and interest, and sorry again that June's blog is a tad shorter than normal this month! I'll be exhibiting in Cheltenham's Imperial Gardens from Sunday 6th July until Saturday 12th July on Screen 8, and also 20b. You can see my current artwork on my online gallery.